A few weekends back I took my car in for its fortnightly wash. My local carwash has a customer waiting area with a great coffee bar adjacent to a small lounging area. With cappuccino in hand I settled down in one of the large black sofas, scanning the coffee table next to me for some reading material. Not expecting much, as there was the usual array of car, gadget, health and rag mags on offer. I settled on a home improvement mag hidden somewhere in the middle of the pile. Flicking through the magazine I came across an advert which used a quote from Massimo Vignelli as its headline. 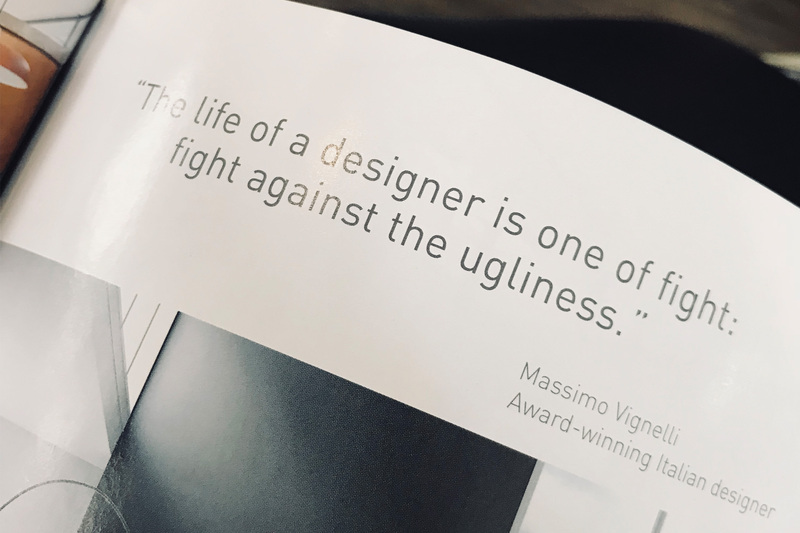 The quote said “The life of a designer is one of fight: fight against the ugliness.” It struck a chord, as I have often believed this myself. So I took out my phone, took a pic, did the usual artsy photo edit and promptly posted it to my Instagram and Facebook pages. A few likes later a friend of mine in New Zealand responded to the post, “Frequently against the ugliness of other designers.” Slightly taken aback, I immediately wanted to respond in defence of my industry. Then I got to thinking. Maybe he had a point, given some of the recent rebranding that has taken place in South Africa. Is laziness the new norm? Are we so smitten with digital platforms that we have forgotten how to create effective branding across all media? It irks me to read all the follow-up explanations of how these brands were designed to work best in their digital ‘brand-ecosystems’ (Cool term), yet they fail in real world applications. Not to mention how bland they have become, afflicted with the sameness that comes from having to design an ‘avatar’. I get it, the world is moving towards these digital platforms at pace, but I sincerely hope that soon we will embrace them as part of the marketing mix, thereby being more rigorous and robust in our brand design solutions.